With more than 80 years of expertise, Purdy is set to expand its product profile in 2015 – rolling out a series of new products that include; the Revolution Frame, Power Lock Extension Pole and Marathon Roller Sleeve. Purdy knows attention to detail is important to professionals, so they’ve carried out extensive durability testing for all three products, creating the ultimate painting tool every decorator should own. The Revolution Frame’s new design is the lightest roller frame in the UK. The new open design frame gives the smoothest roller action and, it makes the application and cleaning much simpler – preventing water and paint from staying inside the dog bone. The Revolution Frame is compatible with the new Power Lock Extension Pole. 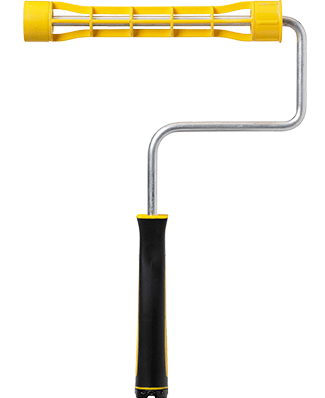 The high quality Power Lock Extension Pole is made from fibre glass and aluminium and is extremely durable, complete with a reinforced rubber, shock resistant grip. The locking pole mechanism works by having a set of stainless steel cam rings that secure the pole in to position delivering infinite adjustment for any job. The new Marathon Sleeve is the most versatile sleeve in the Purdy range . With an exclusive blend of Nylon and Polyester, the Marathon sleeve has the paint pick up of a knitted sleeve with the durability of a woven sleeve and even resists matting after extensive use. Providing excellent paint performance, the versatile sleeve can be used both inside and out with all types of paint.